"The group that banded together for Ladies' Mile should be congratulated on being "
Since 1980 USCC has been instrumental in getting 14 individual buildings landmarked. 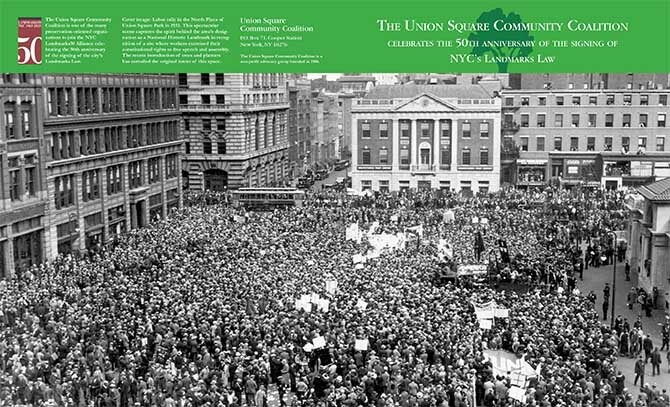 USCC also participated in earning landmark status for more than 400 additional buildings by helping to organize the campaign to create the Ladies' Mile Historic District in the Union Square area in 1989. Later, in 1998, the Landmarks Preservation Commission designated the 10-building East 17th Street/Irving Place Historic District as the result of strenuous lobbying and research by USCC, the Gramercy Neighborhood Associates, and the Historic Districts Council. Among the occupants of these properties, between Union Square East and Irving Place, have been Washington Irving, Elsie de Wolfe, and Oscar Wilde. What you can do to speed the designation process: Letters from the public at large, individually composed in support of landmark designation, are a key element in the Commission's consideration of any property for protected status. To learn more about the process, go to the Landmarks Preservation Commission. Down load beautiful color brochure & self guided tour of historic buildings in the Union Square park area to celebrate The 50th Anniversary of the Signing of NYC’s Landmarks Law in 2015. Produced to celebrate The 50th Anniversary of the Signing of NYC’s Landmarks Law in 2015 this eight page color brochure contains period and contemporary images of buildings USCC has successfully supported for landmark designation all within a three block radius of the park. USCC also imagines the future: The brochure also highlights five remarkable buildings it hopes to receive landmark protection. The eight page publication was created by Carol Greitzer and Jack Taylor, Graphic design by Miriam Berman: Map Art by Tracy Turner; with contemporary photography by Geoffrey Croft. USCC is currently advocating to landmark an additional five buildings in the area. The texts and photos are found in the brochure. Believed to be oldest remaining apartment house in NYC. Luce concieved Time magazine in 1922.